I’m a sucker for a marketing campaign hyping up the recovery of an injured athlete. One recent favorite is Nike’s Paul George ad, which closes with: “The worst has happened. The best is next.” The message here is universal: Your response to adversity is a measured opportunity for definition. We see this principal in action daily on social media. A slip up by a brand goes viral and the comeback is magnified. While marketers may dread an impromptu spotlight, it’s a unique chance to demonstrate agility, humility and, most importantly, humanity. Facebook’s algorithm rewards posts that see high volumes of rapid interaction. The likes and replies to clever comments on this post, including Inc.’s own, actually helped boost the post’s audience reach. Here, a little humor went a long way in shaking off a harmless mistake and generating a positive net outcome. The recent release of Lilly Pulitzer for Target quickly became THE floral print tragedy of our time. The limited-quantity collection sold out in stores in a matter of minutes, and droves of online shoppers, who stayed up until 3 a.m., crashed the retailer’s website. The resulting flash-sale caused a firestorm of questions and complaints on social media. Target released a short string of updates during the early hours of the sale, but once the collection had sold out, its Twitter account went radio silent. For two days. This was not the case at Target’s Facebook page, where the social team scrambled to answer countless restocking questions and apologize profusely. For two days. 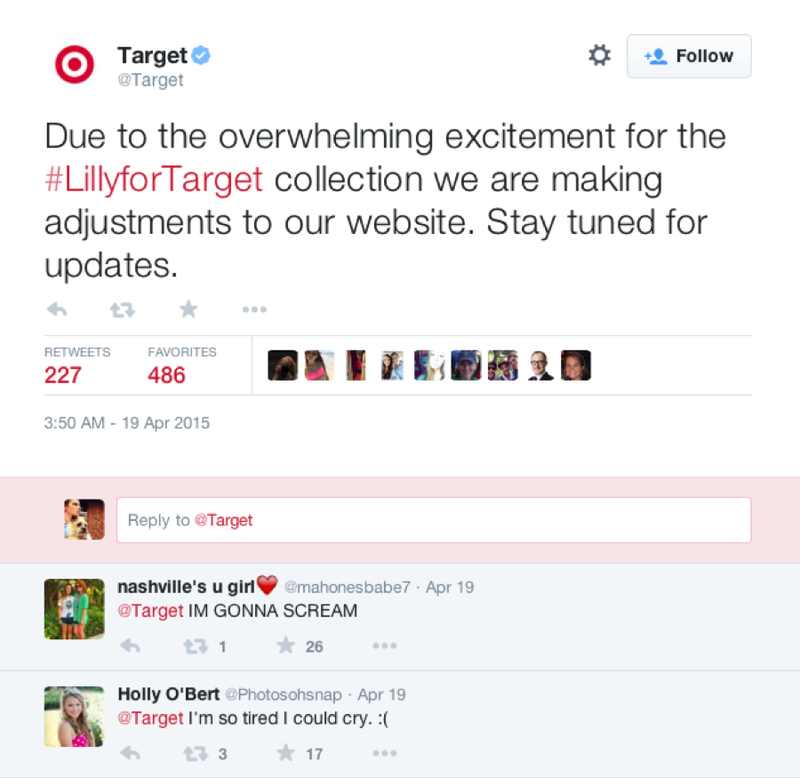 By Wednesday, Target’s social channels were back to posting new content and engaging in friendly, helpful conversation. Unfortunately, that same warmth the brand had established with its Twitter community was noticeably absent in a crisis. Four years ago, the launch of “Missoni for Target” similarly crashed the site’s servers. Given the bubbling anticipation of the Lilly Pulitzer line, Target really should have been prepared this time around. That means readying a strategy – and a response team – that’s able to maintain the brand’s voice, even while buyers are breaking down digital walls. 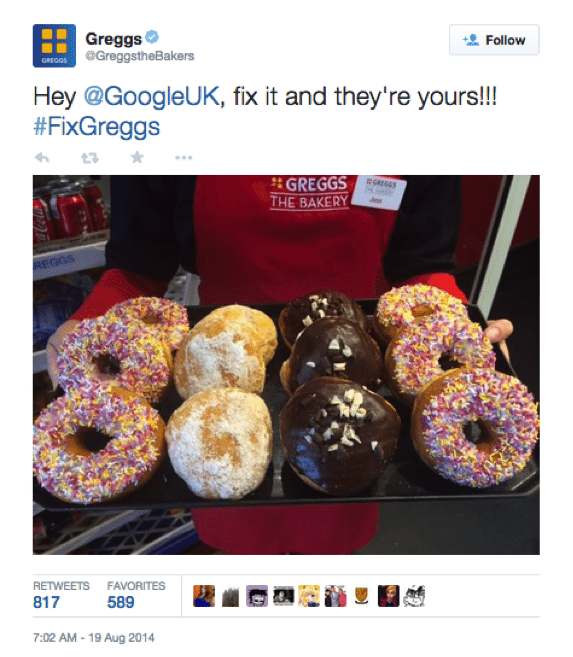 Greggs, the U.K. bakery chain, recently put the kibosh on a potential PR disaster with one swift and playful social media response. One day last fall, a search for Greggs on Google showed a fake and perverse logo as the top result. 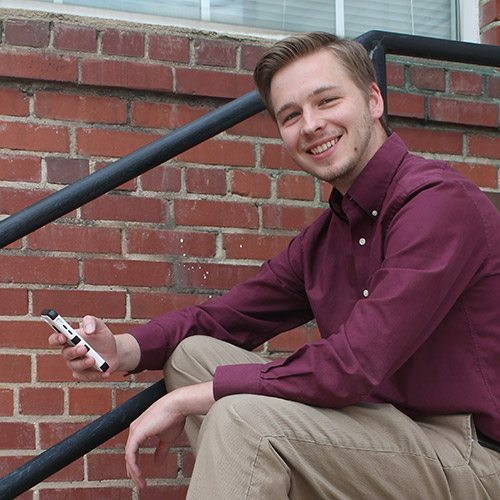 Customers were insulted and took to Twitter with their proverbial pitchforks. While Greggs didn’t start the fire – and couldn’t put it out itself – it did have the responsibility of a resolution. Greggs needed to pass this albatross urgently to see a positive outcome. That morning, Greggs literally delivered the goods. The result? Greggs’ Twitter follower count grew three times faster on that day than on average. Brands don’t always need to be humorous and self-deprecating, but they should have a human voice, especially when responding to pressing issues. 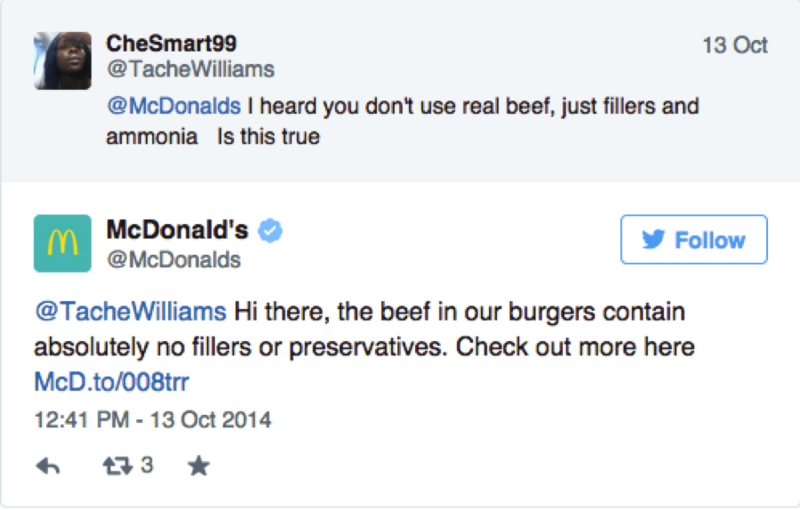 The McDonald’s social team was not exactly “lovin’ it” when a 2012 Twitter campaign abruptly backfired. The fast-food chain invited fans to share sunny memories with the hashtag #McDStories. As you can imagine, the Internet jumped at the chance to publicize horrific encounters with the food and raise big-picture concerns about the company’s practices. It took well over two years for McDonald’s to prepare an appropriate response to the #McDStories fiasco. In late 2014, the company launched a brave Q&A campaign across its social channels, with the goal of dispelling numerous unsavory notions. Along with addressing Twitter questions head-on, online videos featured a “MythBusters” host taking tours of the company’s suppliers and restaurants. Sure the transparency campaign was selective – and at times cloudy – with the truth. But the willingness of this corporate giant to be honest with its customers was a refreshingly bold response to a blockbuster PR disaster. What brands have you seen recover well from a social media stumble? Share with us in the comments below.